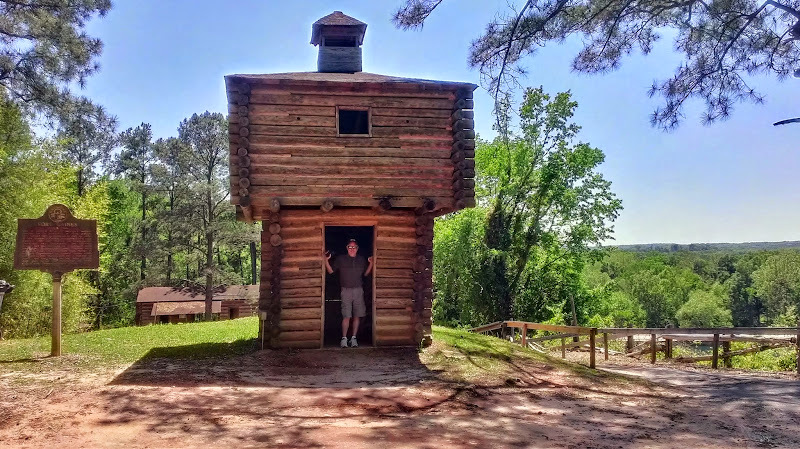 On Monday, April 21st, we decided to take a ride around the area surrounding Cotton Hill Campground to see what’s what. 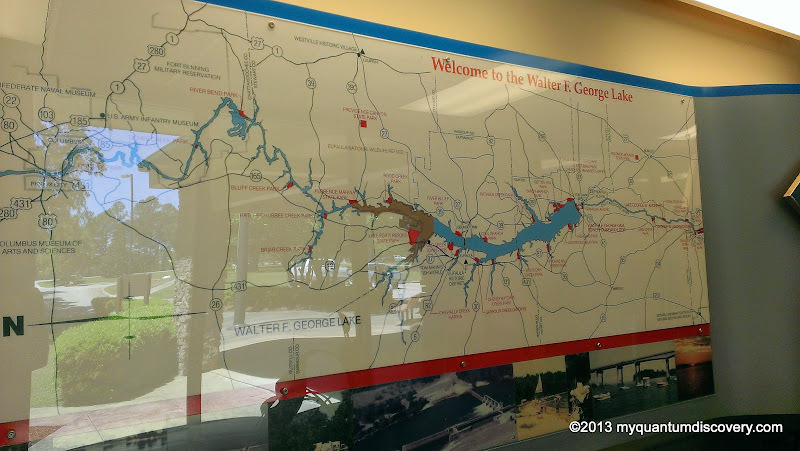 Our first stop was the Lake Walter F. George Visitor Center where they had displays about the local animals and birds, the history of the area and a map of the lake. After looking at the displays, we wandered out the back door onto a balcony where there was a beautiful view of the lake. After leaving there, we proceeded a short distance down the road, taking a right towards the Walter F. George Dam & Locks. 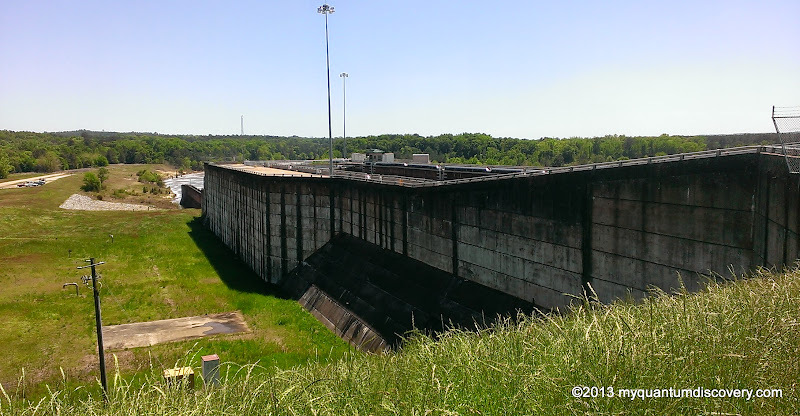 The dam and lock were completed back in 1964 by the Army Corps of Engineers forming the Walter F. George Lake (Lake Eufaula) on the Chattacoochee River between Alabama and Georgia. 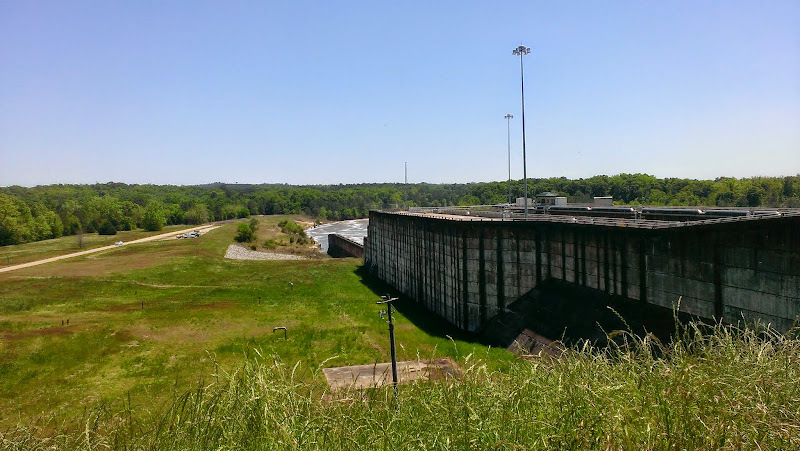 It consists of a 1,496′ long concrete structure housing the spillway, the lock and four generating units plus two earthen dams that extend 5,810 feet along the Georgia border and 6,130 feet along the Alabama border. Barge traffic and commercial/recreational navigation of the river and lake is accommodated by the 82′ wide by 450′ long lock. The water flow and power generation for the lower Chattahoochee River are regulated around the clock in the control room by operators. According to this article, sink hole activity occurring during construction as well as in subsequent years, caused seepage and required constant repairs. 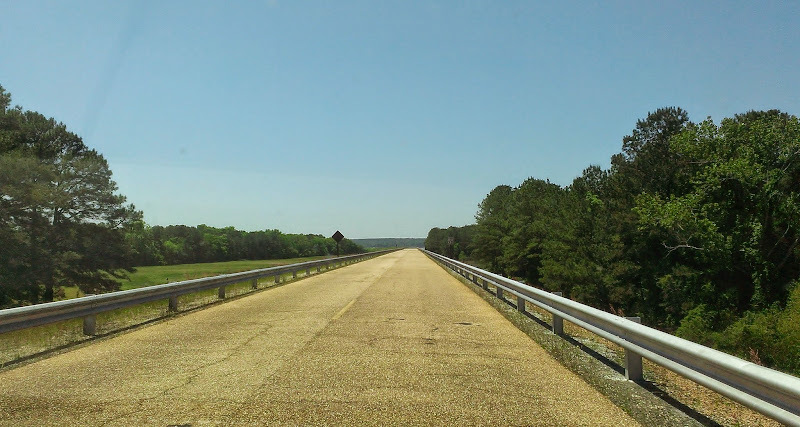 In 2004, a 1,831′ long upstream cutoff wall was built by the Army Corps of Engineers. 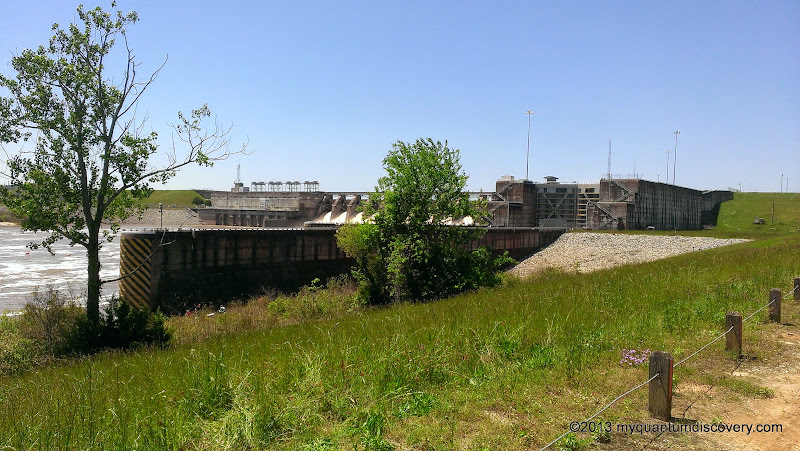 This was the first of its kind because it was built with the reservoir full, while electricity was being generated, in water depths up to 100 feet and within 20 feet of the existing dam. Quite an engineering feat! 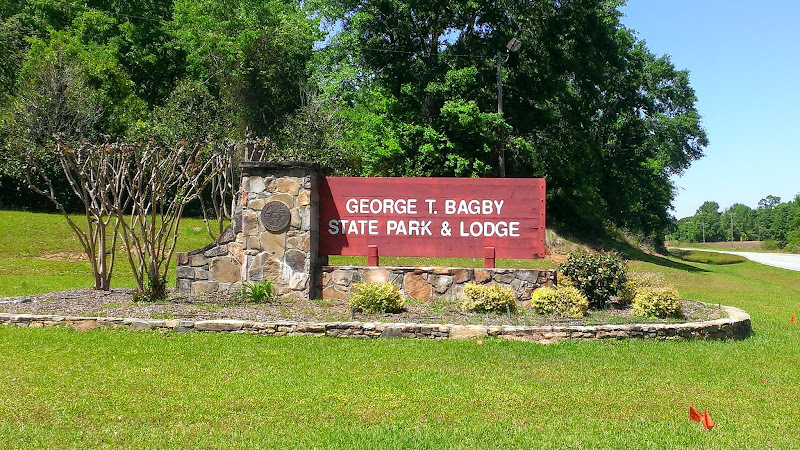 After hanging out there for a bit, we headed over to one of the many state parks in the area – George T. Bagby State Park and Lodge. We took a ride through the park just to check it out. Nice day use areas but no campground. There is however a marina, cabins and Lodge style motel. First we checked out the marina. 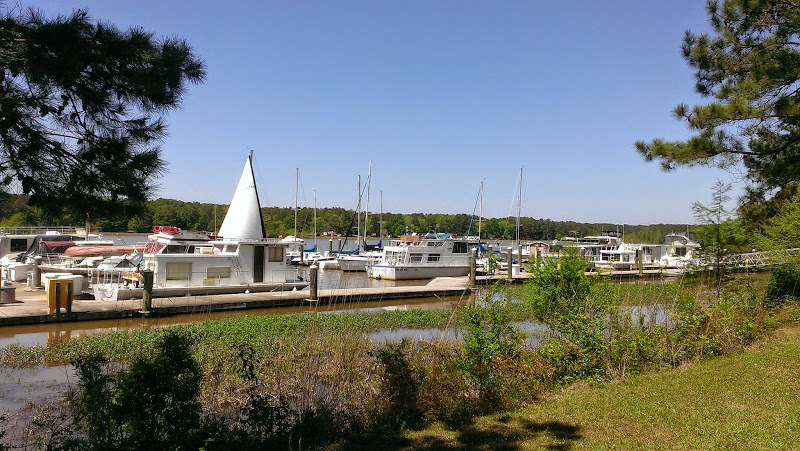 From our campsite at Cotton Hill, we could see the marina across the lake so we were interested to see what it was like up close. Although it was not that large, all of the slips seemed to be taken, occupied by pontoon boats, a few powerboats, sailboats and houseboats, including what appeared to be a the home made “yacht” pictured to the left. From there, we continued our drive through the rest of the park. It was quite nice, heavily wooded with an occasional view of the lake and several picnic areas. Eventually we arrived at the Lodge, surprised that there weren’t many cars in the parking lot, initially causing us to think that perhaps it was closed. But when we walked into the entrance, we were greeted by several friendly staff members so we’re guessing that this must be their off season. They do have a restaurant there but even though it was in the early afternoon it was empty. Although the lodge looks quite pretty on their website, it’s somewhat less impressive in person, at least from the parking lot side. We forgot to take pictures and we did not get a look at the lakefront side. 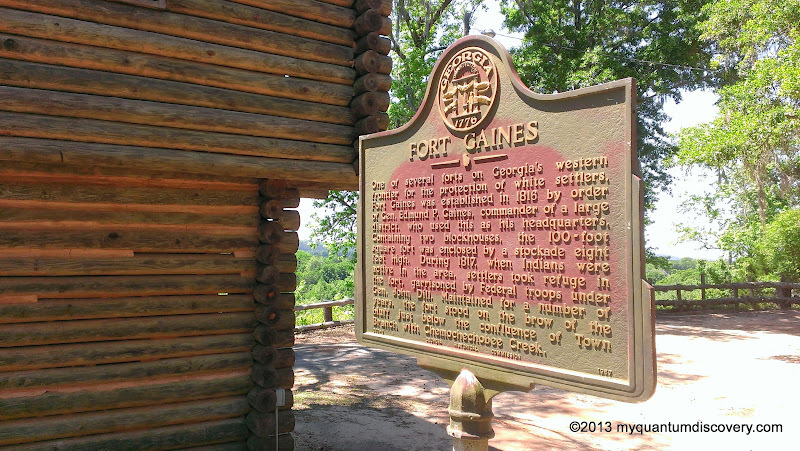 After we left the park, we headed back to the town of Fort Gaines. 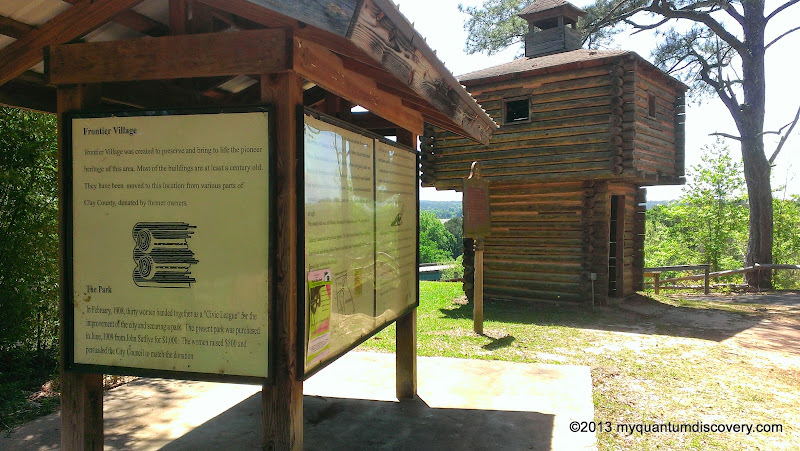 Founded in 1816, Fort Gaines is a small rural community with a population of about 1100 according to the 2000 census. Driving along the main street, it seemed like a lot of the store fronts were empty. We were just about ready to head back to the campground when I happened to notice a sign pointing down a side street for Frontier Village. That was strange, I didn’t see anything in any of the literature for the area about an attraction or historic site by that name. 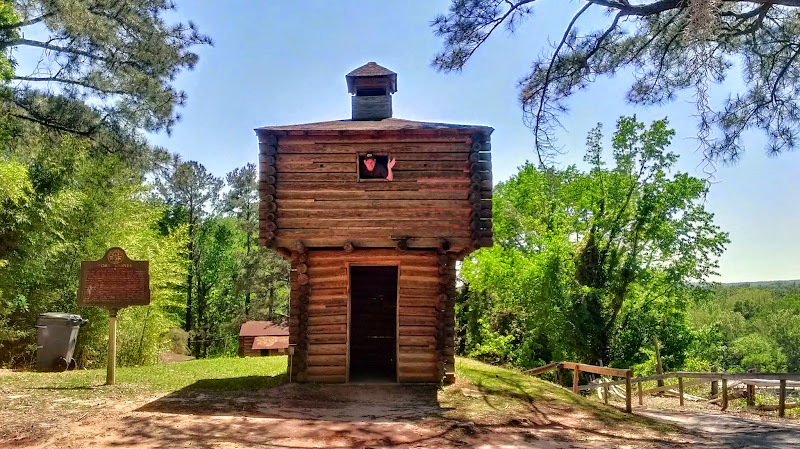 It turned out that Frontier Village is located in Bluff Park which has existed since 1908 and overlooks the Chattahoochee River downstream of the dam. 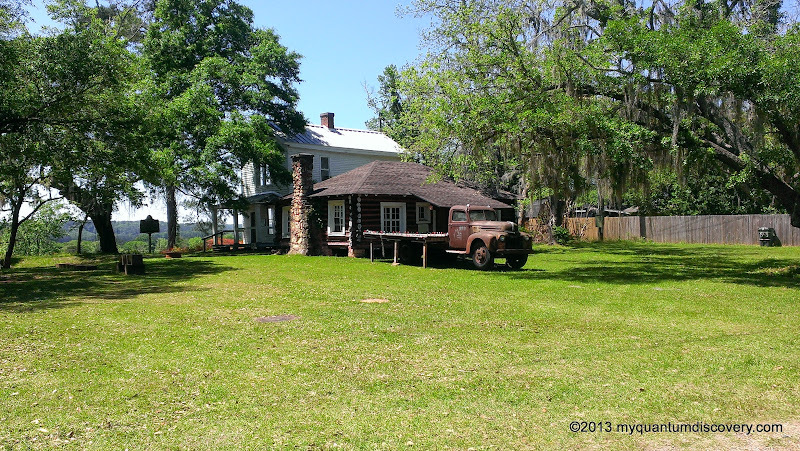 Most of the buildings in Frontier Village have been relocated from various parts of Clay County and are over a century old. We could have walked down the hill and explored each of the historic structures but I guess we were being lazy. 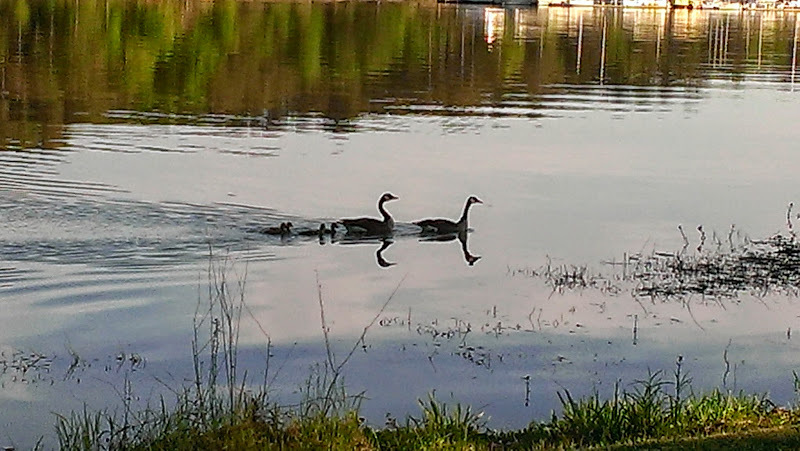 Since it was getting late, we hopped back into the van and headed back to the campground to enjoy the rest of the beautiful day. That night we had a campfire, watched the sunset and enjoyed leftovers from our Easter dinner. 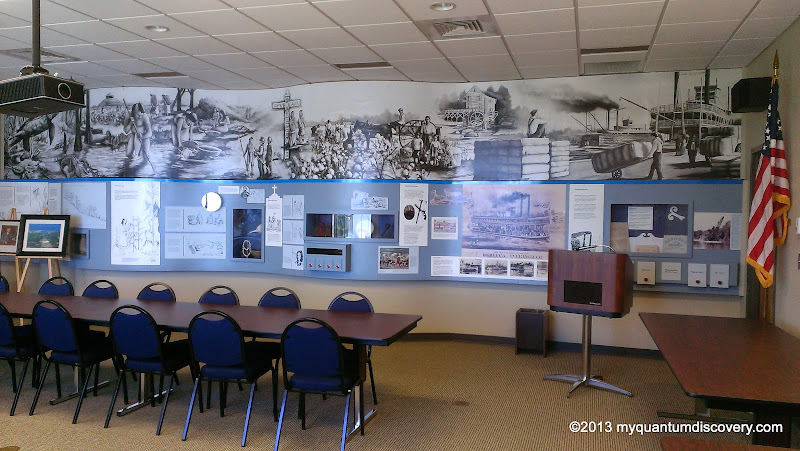 But we weren’t done with sightseeing here yet – stay tuned for more info about this area in our next post! Nice descriptions. The dam and Fort remind me of dams along our Columbia River and forts in Oregon.